If you click the Analyze tab’s Fields, Items & Settings command and choose Solve Order from the submenu that appears, Excel displays the Calculated Item Solve Order dialog box. In this dialog box, you tell Excel in what order the calculated item formulas should be solved. In Excel 2007 or Excel 2010, you click the PivotTable Tools Options tab’s Formulas button and then choose Calculated Item from the menu in order to display the Insert Calculated Item dialog box. In many cases, the solve order doesn’t matter. But if, for example, you add calculated items for October, November, and December to the Kona Koast coffee product sales pivot table, the solve order might just matter. 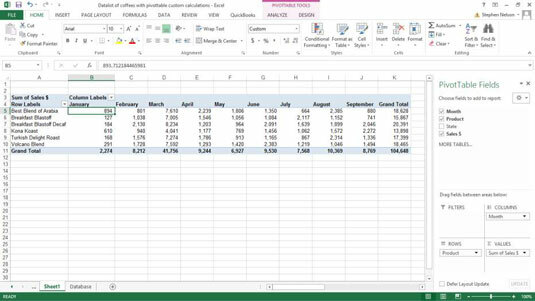 For example, if the October calculated item formula depends on the previous three months and the same thing is true for November and December, you need to calculate those item values in chronological order. 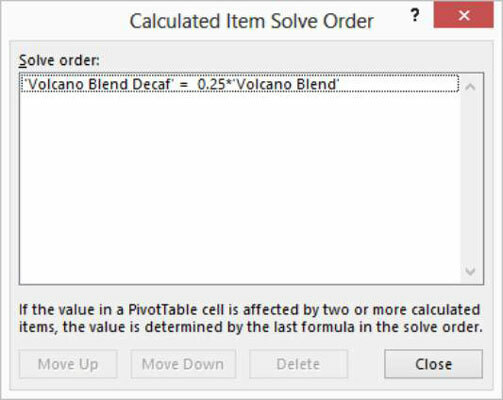 Use the Calculated Item Solve Order dialog box to do this. To use the dialog box, simply click a formula in the Solve Order list box. Click the Move Up and Move Down buttons to put the formula at the correct place in line.